Amazing flashmob in front of my one of my favourite public buildings/squares: Peter Celsings Kulturhuset in Stockholm (1966-1971). You could call Centre Pompidous (1972-1976) programmatic qualities a mere copy of it. 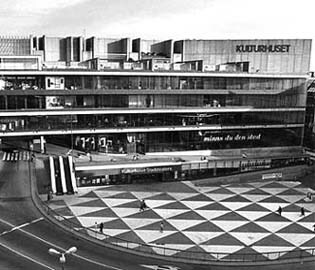 In my opinion Kulturhuset works even better, the lowered square connects different pedestrian routes and tunnels them under a major street. The initial design also marks all the functions by lettering them on the facade: OMA’s diagrams of the 90’s.